At London 2012, I was part of the British Olympic road race team working for Lizzie Armitstead as she claimed Great Britain's first medal of the Games. It was four years on from my triumph in the same event in Beijing and it was incredible to see the huge crowds lining the roads in London and Surrey in the pouring rain, willing us on. It vindicated what I had said many times - women's road cycling was a spectacle people wanted to see. The public are actually far more fair-minded than they are painted by many a sports journalist or marketing executive. They value their daughters' achievements as highly as those of their sons. Lizzie used the platform of winning the silver medal to talk about sexism in cycling, which she described as overwhelming, and urged the powers that be in the sport to close the gap that still exists between men's and women's cycling in terms of media exposure and money. It was a story I was all too familiar with, so it is great to see the coverage women's cycling is getting now and witness that divide starting to narrow. But as this change occurs, it would be well worth taking stock and considering where we really want sport to take us. To those of us who watched Lance Armstrong's performances on a bike with incredulity, it is some solace that - albeit more than a decade after his ostensible heroics - his myth was properly exposed, both to the public and to a sporting press that had seemed in determined denial. The American was eventually stripped of his seven Tour de France titles. He had actually tested positive as early as 1999, the year of his first Tour de France title, but cycling's world governing body, the International Cycling Union (UCI), allowed his team's management to generate a post-dated certificate of exemption for medical use of the banned substance. This was against the UCI's own rules but the management of the sport thought it expedient to have any winner, rather than have another cycling 'drug cheat' story across the newspapers. Is this moral vacuum at the highest level of sports administration limited to cycling and perhaps, as this week's events have suggested, football? It would be illogical to think so. At any question-and-answer session, I always get two questions. One is about the prevalence of drugs in women's cycling and the other is whether the testing has caught up with the cheats. In other words, is the sport fair? And if it isn't, what is the point? For some, of course, success and the money it brings overrides fairness. So if it's life-changing wealth and the greed it generates that corrupts fairness, does a lack of money equate to cleanliness? And in that case, would we be better advised to keep women's sports impoverished to ensure clean competition? The answer is more nuanced. Obviously money is a great driver, but other factors are at work. One witness in the Armstrong saga was a young American rider called David Zabriskie, who had admitted to using performance-enhancing drugs (PEDs). In his affidavit, Zabriskie identified as a turning point a conversation with Canadian cyclist Michael Barry and his American wife Dede, also a professional cyclist. According to Zabriskie, they convinced him using PEDs was necessary to stay in the sport. At Athens in 2004 I was in terrific form. I had beaten Dede Barry on many occasions but on this very big occasion, she caught and passed me as if I was some novice. Her husband had spent a career denying ever using doping products. Once the Armstrong scandal broke he wrote another book telling a different story. Apparently he and Dede used to keep EPO in the family fridge. Dede Barry still has her Olympic silver medal from the day she roared past me; after all, she passed the tests. So can women carve a different path? Shortly after I turned professional in 2002, I shared a house with Australian cyclist Rochelle Gilmore and we would spend a lot of time discussing and plotting how we would like to improve our sport. Both of us dreamed of running a good team. I tried it in 2009, but the timing wasn't right and I couldn't attract enough sponsors to make it work. Post-London 2012, and with support from the lottery, Rochelle launched the Wiggle Honda team. Three years on and she identifies it is a sustainable business model thanks to an increase in TV coverage and greater demand from the public, who want to see women's cycling. But the riders deserve more. I won back-to-back Women's Tour de France titles in 2006 and 2007 but the last time it was put on as a stage race was in 2009. While Le Tour Entier has campaigned for a resumption, so far the organisers have only granted a one-stage race La Course - albeit on the final day of the men's race. We're at a tipping point and as women's sport evolves it would do well to look at what is best practice across other disciplines and not blindly seek to go where the male version of the sport has ended up. Away from cycling, where has wealth taken British football? Watch a referee make a decision and see the stars crowd round and intimidate him. Some sports administrators get what sport is about - complain to the referee in rugby union and the penalty is immediately moved 10 metres forward - but the governance of sport is a heavy burden and, sadly, some sports appear to be governed by individuals totally oblivious to these responsibilities. Does women's sport want to go where greed, corruption and a lack of respect are commonplace? I believe some of the most difficult battles for women's sports will be fought in the boardrooms of the governing bodies. We have unique selling points and at this crucial juncture we should ensure that we bring ethics to events, and sponsors who will support the application of those principles. Then we can showcase just how great women's sport can be. 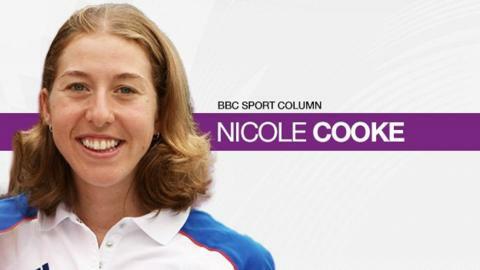 Who inspires British sports women?